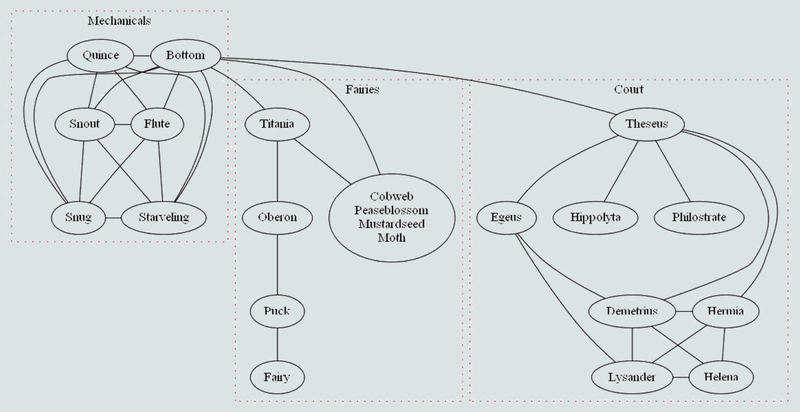 This diagram displays which characters speak to each other in A Midsummer Night's Dream. The characters group cleanly into the mechanicals, the fairies and the court. Bottom is the only character who talks with people in each group. The mechanicals (other than Bottom) never encounter the fairies. The court people don't encounter the mechanicals in the woods. The court people generally don't even know the fairies exist. speak their lines in the play. who speaks with a Fairy in Act 2. Even when Titania and Bottom's talk to the little fairies, the little fairies never speak to each other. Puck and Titania never speak to each other. The court contains two conversation subgroups: younger and older. The younger subgroup (Hermia, Lysander, Demetrius, Helena) talk directly at each other, but rarely address themselves as a group. Egeus, Hippolyta and Philostrate speak only to Theseus, never to each other. In fact, Hippolyta only ever speaks to Theseus! No one from the older court speaks to Helena!